4/3/2011Share this story on Facebook! 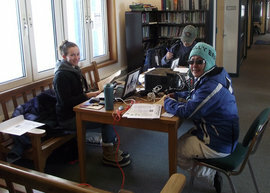 Meghan Miller, M.B.A. '12, works on tax returns in Alaska. Want to Learn More About the VITA Program? For more information about the Volunteer Income Tax Assistance program at Ithaca College, check out this article's companion in the Spring 2011 issue of Fuse! Of all the reasons to visit Alaska, filing tax returns may seem a bit unconventional. For three accounting students in the Ithaca College School of Business, though, this was the main draw. The annual trip up north is part of the Volunteer Income Tax Assistance program (VITA), and coordinated through the Alaska Business Development Center. “It was something different,” says Meghan Miller, M.B.A. ’12, one of this year’s participants. “We went to the heart of Alaska, which [usually] only the natives ever get to experience.” Miller was also joined by Michael Grillo ’11, and Brian Erickson, M.B.A. ’11. Upon departing from Anchorage, the group was split up into two different “Engagement Teams,” composed of two tax preparers and one supervisor. Although Miller and Erickson had the privilege of working on the same team, Grillo was split off and traveled separately. 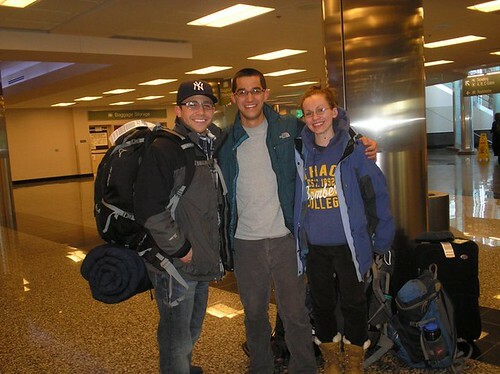 Mike Grillo '11, Brian Erickson, M.B.A. '11, and Meghan Miller, M.B.A. '12, ready to depart to assignments in Alaska. With experiences as unique as the village names, the students were able to walk away with some unforgettable memories. “I was the authority figure,” says Miller. “We needed to be resourceful, and we never knew what situation we would walk into next.” In one of the villages where Miller and Erickson worked, they were stationed in a snowmobile repair shop -- not exactly a typical accounting office. The teams usually worked from 8:30 in the morning to 12:30 at night, sometimes without any breaks. “People came from over 30 minutes outside the villages by snowmobile, and then waited eight or nine hours in line to get their taxes done,” comments Grillo. Needless to say, the natives were very grateful for the volunteers' work. Miller and Erickson were even treated to some delicious home-cooked moose by one of the natives, as a token of gratitude for their hard work. 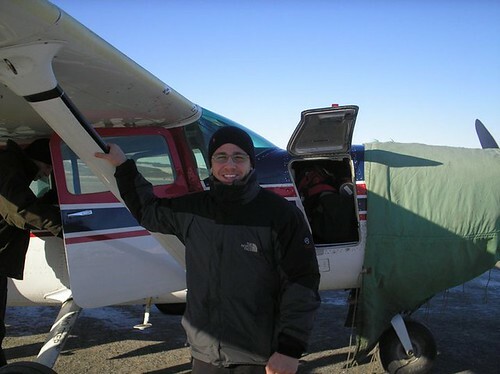 Mike Grillo '11 gets ready to board a small plane to another remote Alaskan village. After nine days of intensive training, traveling, and tax preparation, the three finally got a chance to reflect back on their journey. “This was one of those experiences that no one pushed me to do,” says Grillo. “When you push yourself and step out of your comfort zone, the rewards are endless.” Although the trip definitely broadened their knowledge of taxes, they also learned much more than they thought they would. “Most of the natives didn’t even know how to fill out a simple tax return,” continues Grillo. “This trip turned the tables of my education – now I was educating these people on tax preparation.” By living in each village for multiple days, the teams also had many meaningful interactions with the locals outside of work. In a final reflection, Erickson notes, "The trip was truly an eye-opening experience. The eskimo culture is very unique and we can learn valuable lessons from them. I hope that more IC students take advantage of this incredible trip in the future." 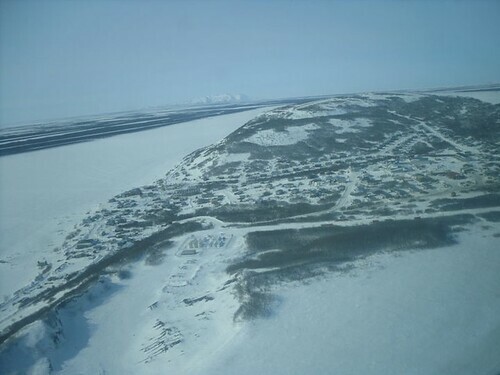 The vast emptiness between many villages visted by VITA students is most apparent from the air.